Whether in Assassin's Creed Odyssey or any other loot-based game, we've all been there: you have a set of armor that looks cool as hell... and it sits in the back of your inventory while you wear a mismatched set of statistically superior gear that makes you look like you tumbled backwards through a combination blacksmith/fetish shop. Ubisoft's solving the problem with a new feature it calls Visual Customization, before admitting you probably already know it by another name: transmogrification. 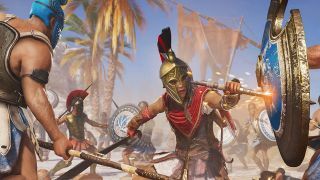 Once update Assassin's Creed Odyssey update 1.07 rolls out on Thursday, transmog will work much the same way it does in World of Warcraft: you select the equipment with the stats you want, then you hit a button that lets you overwrite its appearance with any other piece of gear from the same category that you've previously obtained. For example, you can make your mighty Poseidon's Trident look like a more humble Pilum because they're both in the spear category. You couldn't make your sword look like a spear, or your helmet look like a breastplate, and you definitely couldn't make your sword look like a breastplate. Beyond those restrictions, you're free to mix stats and appearances however you like with no cost or cooldown. Don't worry if you've already dismantled or sold some cool looking stuff; the transmog unlocks apply retroactively to every piece of equipment you've ever owned, even from before the update. Time to fill out that checklist. Hopefully Reddit user baronk14 is doing a happy dance somewhere, having submitted this brief feature request a few days after Odyssey came out. Whether you've just started or are already dozens of hours in, you could still learn a thing or two about life and death in ancient Greece from our Assassin's Creed Odyssey tips.